What can you do with your USB? But with the rapid development of science and technology today, the more proper question should be – what can you not do with your USB? The USB Aroma Leaf is one of the many USB gadgets that have been designed to showcase a unique feature. It makes you smell good. It makes the room you are in smell good. It makes everyone around you smell good. And with everything smelling good, you will surely be able to work better. The USB Aroma Leaf is a finely-shaped USB device that consists of a plastic shell and a pad wherein you place drops of aromatic oils. To make the USB Aroma Leaf to work, all you have to do is look for a USB port. Your computer or laptop is sure to have one. As you plugged in the USB device in a USB port, it heats up and the aromatic oil starts to disperse in air. You start to smell the sweet scent filling the room. However, since the USB Aroma Leaf is small, it may take quite some time for the scent to fully fill the room. After two hours, the USB Aroma Leaf turns off automatically as a safety precaution. A word of advice though – if there are other people with you in the room, you have to consider and make sure the scent you choose for your USB Aroma Leaf will smell good to them too. 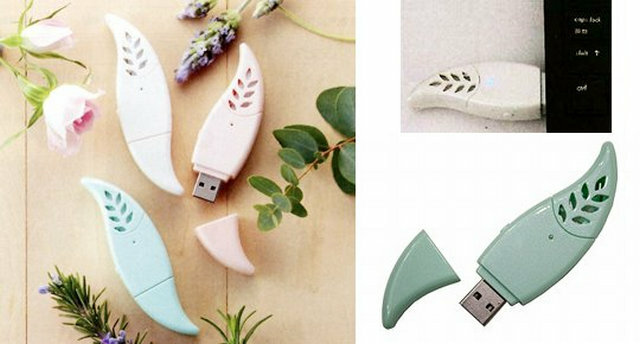 The plastic shell of the USB Aroma Leaf comes in different colors – green, pink, and white. It weighs as light as 16 grams and measures 95 x 26.9 x 13.5mm. It is so handy, allowing you to bring it anywhere with you to make sure you and your room smell good all the time. The USB Aroma Leaf sells for $35, a price some people consider to be a bit expensive. 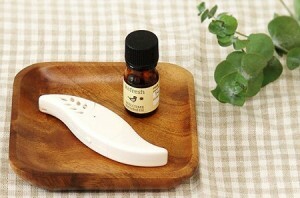 Perhaps to better justify the price, the USB Aroma Leaf comes with a bottle of aromatic oil for free. This entry was posted in USB Gadgets and tagged Air Freshener, Aromatherapy, Scented Oil, USB Aroma Leaf, USB gadgets. Bookmark the permalink.